Who Would Have Thought This Popular Car-Shopping App Is Among the Worst? - 24/7 Wall St.
New car buyers are going to be a widely courted group this year. Sales are expected to decline by as much as 2.5%, and that’s only if the economy remains as strong as it is now. Carmakers and dealers need all the help they can get. A lot of that help comes from third-party, independent auto industry websites like CarGurus, Autotrader and Kelley Blue Book. Because these sites are independent of makers and dealers, new car buyers expect the information the sites provide to contain accurate information and content, be easy to navigate, be fast and look good while doing all that. Auto industry analysts at J.D. Power regularly evaluate these third-party websites to determine whether they are delivering what consumers want to see in a way that meets ever-rising standards of presentation. For this year’s study, the firm evaluated responses received in January 2019 from more than 4,000 new- and used-vehicle shoppers who said they plan to buy a new vehicle in the next 24 months. Respondents to this year’s J.D. 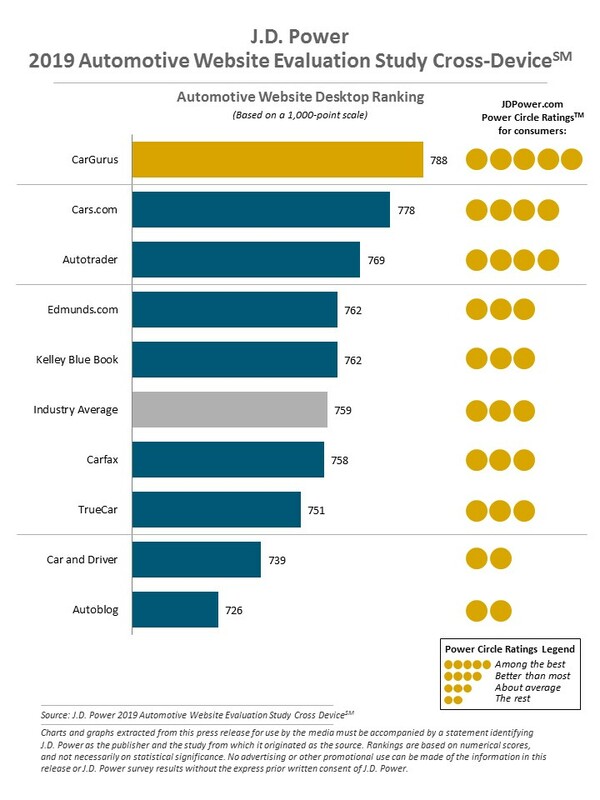 Power survey rated CarGurus as the top desktop website with a score of 788 out of a possible 1,000. Yet the CarGurus smartphone app ranked next to last with a score of 795, nearly 40 points lower than the top-ranked Kelley Blue Book app with a score of 833. The scores indicate that CarGurus may want to step up its smartphone game if it doesn’t want to get left behind. According to a report from Pew Research from February of 2018, 77% of Americans own a smartphone. Just under 90% own a computer. While the difference isn’t vast, it is significant because the smartphone market, while robust, is not yet saturated. And people usually carry their smartphones all the time, and that includes people looking to purchase a new vehicle who may not have thought to use a third-party smartphone app to help with their search. Once they discover such apps exist, they’ll soon discover the best one for their needs. The first chart below gives the ranking of computer applications from nine third-party websites included in the J.D. 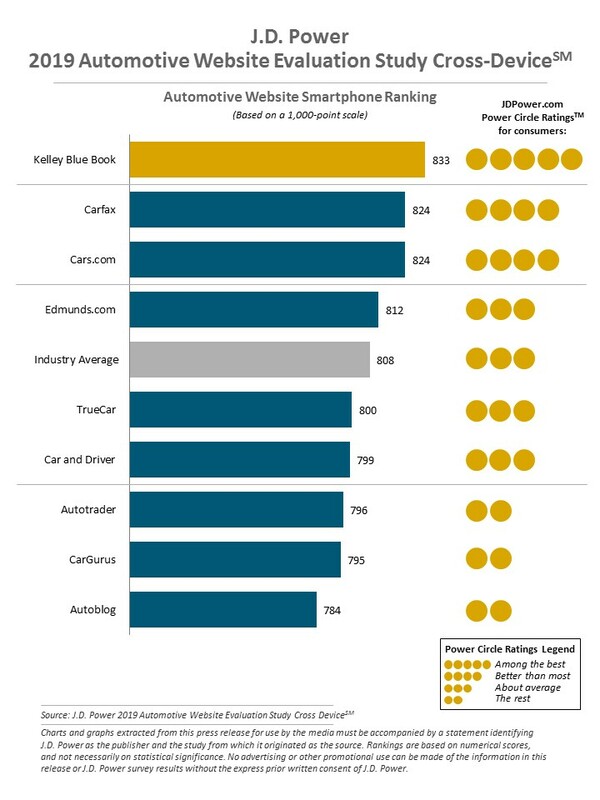 Power 2019 Automotive Website Evaluation Study Cross-Device. The average score is 759. The second chart ranks smartphone apps from the same study. The average score for these is 808.